I find this Detector awesome for my first detector! I have found a bunch of very interesting items from an entire horse shoe game set to gold rings. Yes, its a little mind blowing to learn the manual settings but by doing so I've notice when an auto adjust detector is not setting right. It takes some reading and some practice but I still have it and use it. I agree with the other review. 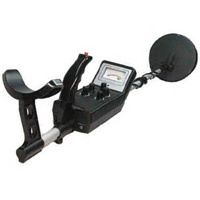 If you think your getting a great deal on a cool looking detector, you've made a mistake. Although this detector is flashy with all the dials and lights, it doesn't do a very good job of detecting. All the features it says it has don't really seem to be there. Also, it will only detect a quarter at a maximum of 4-5 inches down. I would classify this detector as more of a toy than a real machine. If you've seen this detector anywhere on the internet you will have seen it quoted "Tremendous value for the money"
Don't trust any manufacturer's enticing description of the detector because you get what you pay for. I hope this review and any others help you make a solid decision on which metal detector to buy. Do yourself a favor and don't let it be this one. The only good thing I can say about this unit is it was cheap and I got what I paid for. For my first detector I think I bought the worst. It has all the bells and whistles, controls for everything from tuning to discrimination, view meter and flashing lights, but it discriminates everything but pull tabs and cans, even in the coin garden I planted. I've contacted Treasure Hunter on several occasions to ask questions and to date have heard from no one, even the seller will not or cannot answer the simplist operating questions. The only answer I get is, "send it back and we will field test it". If he can't answer a question like "which of the three modes do I search it?" How does he plan on testing it? I do alot more reseach now and this mistake will not happen again. I'm only looking at name brands from now on. I wish there was a minus star rating this one would surely get it. I hope my review has or will help someone, I just wish someone would have written this sooner it would have saved me some money. I am glad there are websites like this where you can give an honest opinon. Keep up the good work.